The act of breathing seems incredibly simple, but doing it properly can be surprisingly complex–and of vital importance to your clients’ performance. The average person’s lungs move about 0.5 liters of air with each relaxed breath. That amount can jump to 3 liters during vigorous exercise. When you inhale, air travels through your nose and mouth and on through the pharynx, larynx, trachea, bronchi, and smaller and smaller tubes called bronchioles (which are the thickness of a hair) to 600 million small sacs in the lungs called alveoli. Each alveolus is surrounded by a net of tiny capillaries, where red blood cells drop off carbon dioxide and pick up oxygen (a process called “gas exchange”). The diaphragm is a dome-shaped muscle beneath the lungs. When you inhale, it flattens and moves downward, pressing against the abdominal organs so the lungs can expand. However, many adults don’t properly engage the diaphragm—poor posture, stress, and other factors lead people to breathe shallowly, moving the upper rib cage more than it should. It can also cause discomfort in the chest and back muscles, weaken the muscles in the pelvic floor and lower back, and disrupt proper movement of the shoulders and spine. To help clients practice proper diaphragmatic breathing, have them place their hands on their lower ribs so they can feel them rise and fall as they breathe. The majority of the breathing motion should be felt here, not the upper chest, during everyday life and especially during exercise. WHAT’S YOUR LUNG DISEASE IQ? Lung disease refers to any condition that prevents the lungs from working properly. People with lung disease often experience shortness of breath and may fatigue sooner during exercise. Here’s a refresher on the guidelines for working with such clients (when their doctor has approved exercise). 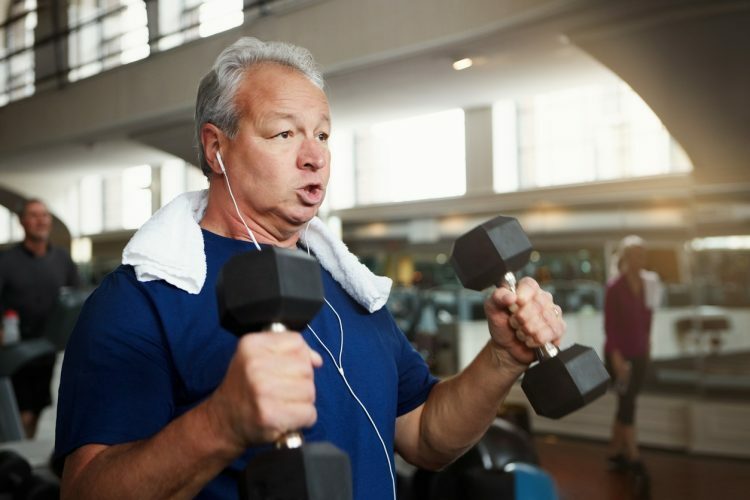 Clients with lung disease generally tolerate aerobic exercise at 40% to 60% of peak capacity, three to five days a week for 20 to 45 minutes. Consider circuit training in a Peripheral Heart Action (PHA) format of 8 to 10 exercises, with one set of 8 to 15 reps per exercise. Emphasize breathing control; schedule frequent rest intervals. Consider using a pulse oximeter during exercise to track oxygen saturation in the blood. Levels should be a minimum of 85% but preferably 90%. Below 85%, stop exercise. The gold standard during strength training is to inhale on relaxation and exhale during exertion. For cardio, you generally breathe in and out through the nose or, when intensity ramps up, through the mouth. Here, a few breath-control tricks to try with your clients. For clients who tend to hold their breath, encourage them to count each rep out loud. If clients experience side-stitches while running, suggest exhaling during the left footfall (not the right). If your client can’t catch his breath, have him stand tall with his hands behind his head to open the lungs and allow for deeper inhalations—don’t bend over with hands on knees. To gauge exercise intensity, use the talk test: If the person can’t talk much, they’re in the high-intensity range. If they can carry on a conversation, the intensity is low to moderate. When cooling down or stretching, deep, slow breathing helps calm the body and aid in recovery. NASM (National Academy of Sports Medicine). 2017. NASM Essentials of Personal Fitness Training (6th ed.). Burlington, MA: Jones and Bartlett Learning.